The Safe-Gel Hydromade System sees the Italian contact lens manufacturer Safilens present a new generation of contact lenses: with the combination of a newly developed material, an innovative product design and modern production techniques, Safilens is setting the standard for quality, safety and comfort. The lenses are characterised by their unique use of the natural bio-polymer sodium hyaluronate, which is gradually released into the eye, replenishing the tear film. The cornea and connective tissue are not just put under no strain, they are also gently cared for. Safe-Gel 30 contact lenses are expertly made and maintain an optimum position on the eye. The outstanding moisture regulation means that Safe-Gel 30 lenses remain flexible, even after they have been worn for several hours. 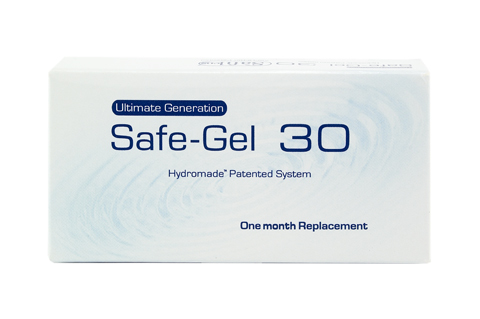 Comfort problems caused by lenses drying out are not an issue with Safe-Gel 30 monthly lenses. Moreover, the broad range of prescriptions available, ranging from +6.00D to -16.00D, allow people who are very shortsighted to also experience the benefits of Safe-Gel 30 contact lenses. Find out about the discounts available when you order Safe-Gel 30 contact lenses and care solutions from the Mister Spex online store. Mister Spex advises all online purchasers of Safe Gel 30 contact lenses: the contact lenses, Safe Gel 30, should always be fitted to your eyes by an eye doctor or optician. The period between fittings, unless otherwise prescribed by an eye doctor or optician, should not exceed 6 months. You should go for regular check-ups. The manufacturer Safilens/your eye doctor/optician's recommended wearing time for Safe Gel 30 contact lenses should be followed strictly. It is your own personal responsibility to make yourself aware of the care instructions for Safe Gel 30 contact lenses and to follow them accordingly. In case of eye irritation or visual impairments caused by Safe Gel 30, remove the contact lenses immediately and consult an eye doctor or optician. Damaged contact lenses should be replaced immediately.